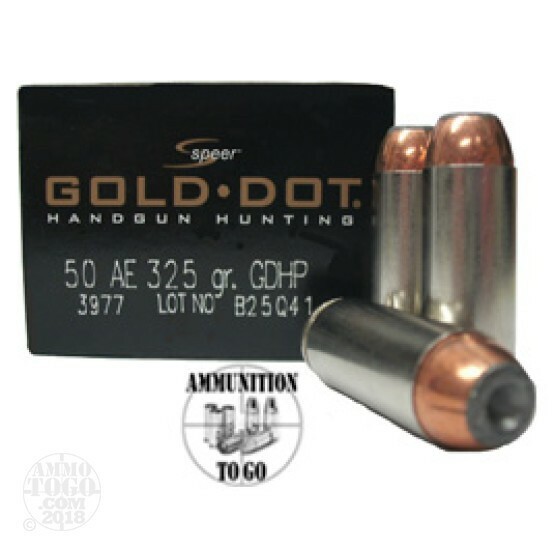 This is 50 AE Speer Gold Dot 325gr. Hollow Point Ammo. This is the Gold Dot ammo that is sold to many Law Enforcement agencies. Speer Gold Dot Handgun Cartridges Uni-Cor construction virtually eliminates core/jacket separation, the main reason for bullet failure with conventional cup and core bullets. A patented process forms the hollow point cavity in two stages. The core is pre-fluted to define the "fault" lines of expansion, controlling final diameter and retained weight. The second process finishes the cavity and controls the rate of expansion. Clean burning propellants deliver optimum velocity while ensuring consistent chamber pressures. This ammo is packed in 20rd. boxes.